Tag line: "Where dreamers can be winners"
When it came to portraying intense, charismatic characters, Burt Lancaster was in a class by himself. In a career that spanned five decades, he took on such notable roles as Wyatt Earp in 1957’s Gunfight at the O.K. Corral, and J.J. Hunsecker, a columnist with an entire city under his thumb, in Alexander Mackendrick’s Sweet Smell of Success. 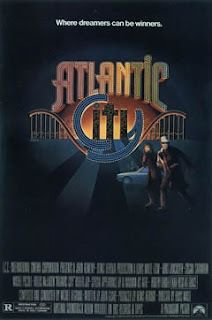 So it stands to reason that an actor of Lancaster’s talent and standing would be the perfect choice to play Lou Pascal, the aging gangster at the center of Louis Malle’s 1980 film, Atlantic City. Only a performer of Lancaster’s strength could bring a character as weak and cowardly as Lou so convincingly to life. From what we can gather, Lou was once a big man in Atlantic City. That is, before the casinos came to town. Nowadays, he’s been reduced to acting as manservant for former beauty queen Grace (Kate Reid), who's also the widow of one of Lou’s former partners. Sally (Susan Sarandon) is a casino worker who lives in the same building as Lou, and Lou is smitten with her. When Sally’s estranged husband, Dave (Robert Joy), comes to down with some drugs he stole from the mob, it’s Lou who helps him find a dealer willing to buy them. The mob does eventually catch up with Dave, leaving Lou as the sole owner of a fortune in drugs. He will use the drug money to help out Sally, but when the mob connects Sally to Dave, Lou finds himself in the middle of a dangerous predicament, with no idea how to handle it. Lou Pascal remains an enigma through much of Atlantic City. He carries himself, at all times, with an air of respectability, yet lives in a run-down apartment building, just upstairs from Grace, who riddles him with insults as he fixes her supper and runs her errands. When the drugs enter the scene, Lou suddenly has more money, and more confidence, than he’s had in a long time, yet his newfound self-assurance goes right out the window when the mob starts hassling Sally. In a key scene, where Sally's being accosted by two thugs, all Lou can do is stand back and watch in abject fear, helpless as they slap her around. Throughout the entire movie, Lou Pascal is seeking a return to the glory of his younger days, yet as the movie progresses, we begin to wonder whether or not he ever even had any “glory” in the first place. Lancaster is one of the few actors who can swagger in one scene, cower in the next, and make both totally believable. With Atlantic City, he and director Malle have constructed a character who is a perplexing mystery, and we have a difficult time getting a handle on either Lou or his shadowy past. He is a relic in the modern world, and like most relics, it takes some digging to finally bring the truth to light. As for Lou himself, he has no problem living in the past, even if it is a past that never was. Great review! I think you hit upon the exact reason why I didn't "like" this movie the first time around. We never have a hero to root for...and maybe that was exactly the point. As you said, he's enigmatic. Even though I didn't exactly enjoy it, Atlantic City has stayed with me over the years. Very hard movie to shake. Thanks to your post, a rewatch would be in the works. Dusty: Thanks for stopping by, and for the kind words. I appreciate them. While I can't say I didn't like ATLANTIC CITY the 1st time I saw it, the film confused me. Again, I'm sure it had to do with Lou. We're led to believe (mostly by his own words) that he was a big man in the town years earlier, yet that scene where he hides while Sally's being roughed up (as well as a few other scenes) kinda hinted otherwise. Were we meant to believe him? After another viewing, I guessed we weren't.